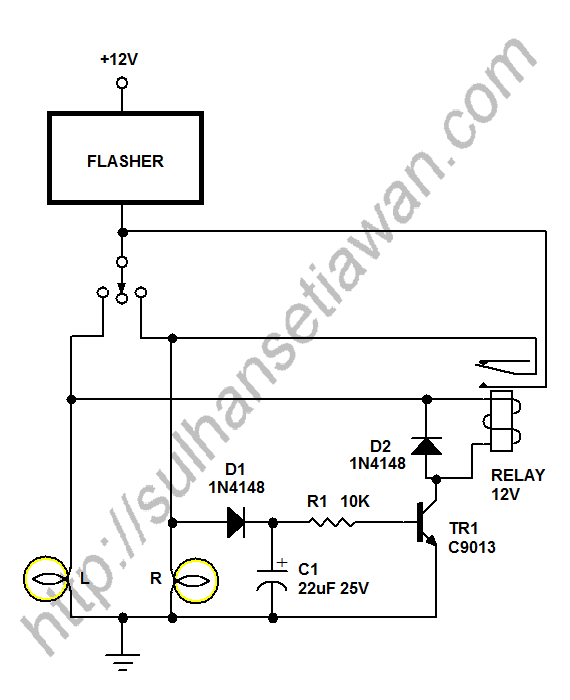 In the post about How to Make Hazard Sign for Motor Cycle without Additional Switch, we use two transistors to controlling the relay, since there are two conditions so that the relay can be activated, viz. the charge in C1 is enough , and the switch is at left direction. TR1 is used to controlling the first condition, and TR2 is used to controlling the second one. Actually, the second condition can be controlled without transistor, but by moving the supply line for the relay from the positive battery to the left lamp. So, although the C1 has enough charge, but the relay will get supply only if the left lamp is in ON condition. With the circuit above, we can save transistor TR2 and resistor R2. However, there is one thing to be aware of if we use the circuit above or the previous circuit, viz. the battery used should not be in the bad condition and the voltage is drops, because if the battery voltage is below 12V, the voltage may not be enough to activate the relay. 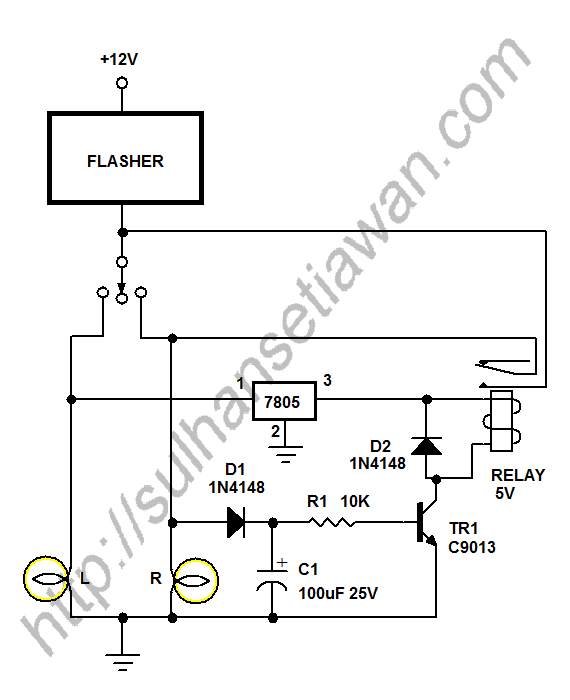 The solution for this problem is by using 5V relay and 7805 regulator like the circuit below. Thus, the worst battery in use, its voltage can be predicted to be still above 5V, and will be enough to activate the relay.